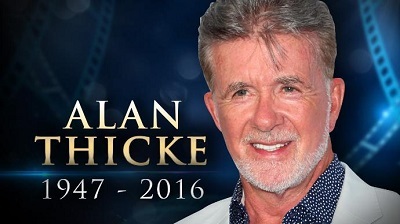 ROANOKE, Va. (WDBJ7) The sudden death of iconic TV dad, Alan Thicke, shocked people from Hollywood, all the way across the country. "I knew Alan, and a lot of people knew Alan. He's been in this business for so long and was really revered, and respected, and yeah, it's just been a real bummer for people. Not even people who knew him, but people who knew him from TV because he was such an infectiously charismatic guy,” said entertainment host and expert, Ken Baker. Only 69 years old, Thicke was in otherwise very good health. So we wanted to know, could this happen to anyone? “I'm not sure I'd say it was typical,” said Dr. Jack Perkins, Department of Emergency Medicine. “Risk factors, there are certainly some everybody recognizes such as cigarette smoking, links to obesity, diabetes, hypertension, high blood pressure, high cholesterol. And then there's others people may not recognize such as family history. Family history is obviously one you can't modify or make any better." "Alan was in great shape by the way. He was 69, but man, he was still playing hockey," Baker said. Thicke was actually on the ice with his teenage son and other friends when he suffered what appears to have been a fatal heart attack. It wasn’t until hours later they had found out their friend had died at the hospital. "If more of our citizens were trained in how to intervene for cardiac arrest in terms of proper chest compressions and use of a defibrillator, certainly not everybody can be saved, but it's something the public can do and it does save lives," Dr. Perkins said. Dr. Perkins says quality CPR drastically increases chances of survival. He says seeing a primary care physician for preventative care is also good practice. Doctors look for any type of signal that there’s a problem that could be heart-related. “Things that raise our concern is symptoms that appear during any type of exertion… mowing the lawn, shoveling snow, playing pick-up basketball, such that are new. You start getting chest pain, you’re inappropriately short of breath…sweating, nauseous, dizziness, pain that radiates to your arm or your jaw. Unfortunately very few people present with a constellation of all of these, and it takes quite a bit of digging to look for something that may be concerning,” Dr. Perkins said. Doctors say age, being female, and having diabetes, or any combination of the three are all additional risk factors for heart attack. And having a public figure die from something so common serves as a reminder for everyone else. "He was doing something he loved with a son who he loved so much, so if you can choose the way you can go, I mean I guess, playing hockey and having a good time with your friends and your son, I mean there are a lot worse ways to go, and I think people are at least holding on to that,” Baker said.